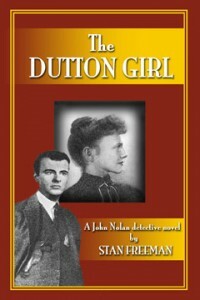 The Dutton Girl ($16.95, 304 pages, 6×9 Trade paperback, ISBN: 978-1-60681-766-0), is a cozy mystery by Stan Freeman. In winter of 1915, John Nolan is learning the ropes as a detective, underpaid and missing his fiancee in Ireland. His status improves when a rich man hires him to investigate the kidnapping of his daughter and the theft of her jewels. The case will test John’s PI instincts, put his life in danger, and teach him valuable lessons about human nature. In January, 1915, John Nolan’s life is in a shambles. A recent immigrant from Ireland, he wants nothing more than to bring his fiancée over too, but he is only a poorly paid private detective living in New York City in a tenement flat without water or a bathroom. When the daughter of a wealthy real estate developer is kidnapped from her Manhattan apartment, the police are baffled. A $50,000 ransom demand puts the girl’s father in fear for her life, so he hires Nolan in hopes that he can find her quickly. Early in his investigation, Nolan realizes the missing girl’s family members are the main suspects. Her father gave her a small fortune in jewelry to avoid losing the pieces in court when he divorced her mother. Everyone in the family needs money, and they all knew where she kept the jewels hidden in her apartment. The case will bring Nolan up against police corruption, the Black Hand, and racist stevedores on the waterfront. And before he uncovers the truth, he must survive a biplane pursuit, a gun battle in the Tenderloin, and finally a deadly chase on the tracks beneath Grand Central Terminal. Book 1 in a new detective series featuring John Nolan. Stan Freeman is a former newspaper reporter whose articles have appeared in more than two dozen publications, including the San Francisco Chronicle, the Seattle Times, the Houston Chronicle, the New Orleans Times-Picayune and the St. Louis Post-Dispatch. For many years, he was the science and environmental writer for the Springfield Union-News and Sunday Republican in Massachusetts. He studied fiction writing in the MFA program at University of Massachusetts. In 2014, he wrote and produced a science fiction feature film, The God Question, that won several awards at film festivals, including best feature film in its category at the Burbank International Film Festival. He has also published several guides to the natural history of individual states in the Northeast. He grew up in Huntington, N.Y., and attended Cornell University. Currently, he lives in western Massachusetts. For more information, look here. By five o’clock, exhausted by sitting and reading, Nolan left the library, resolving to walk as far uptown as he could for the exercise before catching a trolley home. However, with cold winds whipping through the canyons of Fifth Avenue, he got only as far as St. Patrick’s Cathedral on 51st Street. Having never seen the inside of the great gothic edifice, and hearing a pipe organ playing, he found an open door, went in, and took a seat in a back pew of the nearly empty sanctuary to warm himself. Golden light streamed through the high, stained-glass windows as the chancel organ played. Nolan had no love for the Catholic church. His first memories of priests were of beatings in school, so he had formed a lifelong distrust of them. At the same time, he grudgingly recognized that the church had a place in his life. Religion in his own life was simple. It was God’s will that he come to America. And it was God’s will that he marry Sheenagh Casey. He knew nothing more of God’s will than that. It was manifest in the persistence with which he felt these two things. In his daily life, he drew on his own instincts and conscience for what was right and wrong, not on any knowledge of the Bible or on the questionable advice of the priests in his life. And with no immediate family in New York to goad him to attend church, he had been to Sunday Mass infrequently since arriving—and not once in the past six months. He first heard of America from his uncles, sitting with them in parlors and taverns in Ireland as they traded stories. Probably, he realized now, they had heard them when they were young and sitting with their uncles. He believed few had actually been to America. He finally decided to go to America when his impoverished family was forced to move in the fall of 1913. His father had worked on and off as a traveling man for a sugar company. The home in which the Nolan family had lived for thirty years was leased, and the landlord, facing his own financial calamity, served writs of ejectment on all his properties in order to sell them. His parents moved to small rented rooms nearby. He bought a ticket to America. In Nolan’s year in New York, he had suffered as many deprivations as he ever had in Ireland. The reality of New York was far from the expectation of it. For weeks before he made the crossing, he and Sheenagh had written out plans and budgets and then alternate plans and budgets, should this or that go wrong. Little had gone as expected. Jobs in America were fewer than promised—and more demeaning—and salaries were lower. The insults suffered for being Catholic and poor in Ireland were replaced by insults for being Irish and poor in the States. Yet, stepping away from it all, he could see their goals were slowly being met. He was able to put some money in the bank each week, and they were closer to Sheenagh’s arrival and their marriage each week. Perhaps that was the dream of America. God placed in your mind an exaggerated view of how good life there could be in order to convince you to want it and work for it. True, the reality would undoubtedly turn out to be less grand than expected. However—also true, he hoped—the reality would still be well worth the effort. Warmed enough to feel a renewed resolve to reach home, he rose to leave but then sat back down in the pew. A realization had come over him. This kidnapping. He suddenly felt the importance of it in his life. The police were unable to solve it. The family was depending on him to solve it. And the poor girl might lose her life if he did not solve it. A challenge, was it not? A personal challenge. Should he save the girl and return her to her family, he might make the name he needed to succeed in America. Although paid as a detective, he had not truly felt like one until that moment.